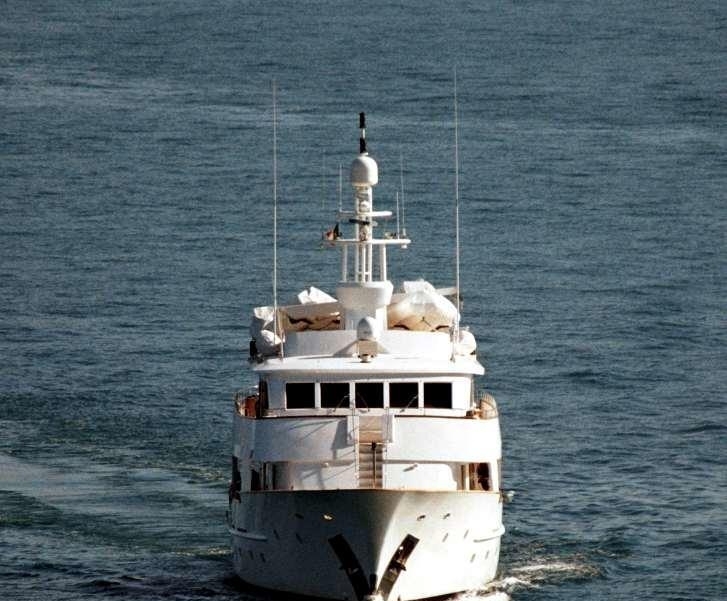 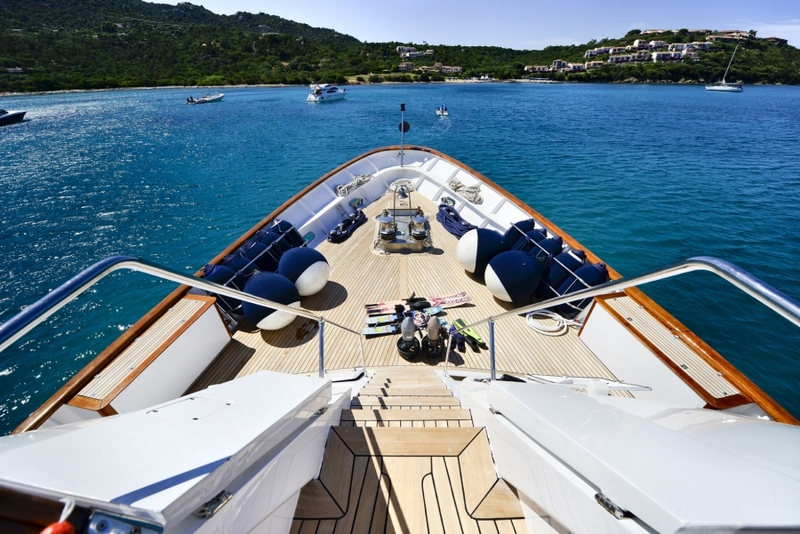 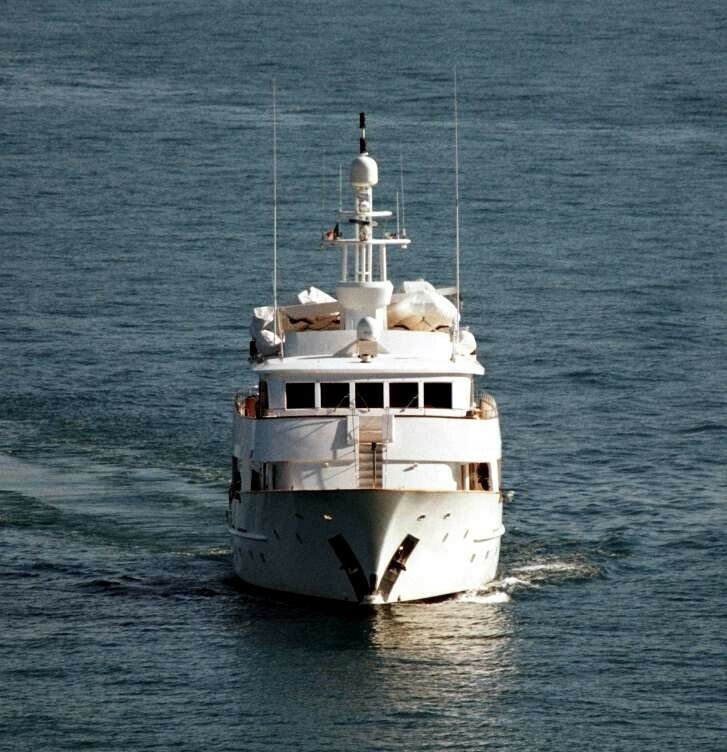 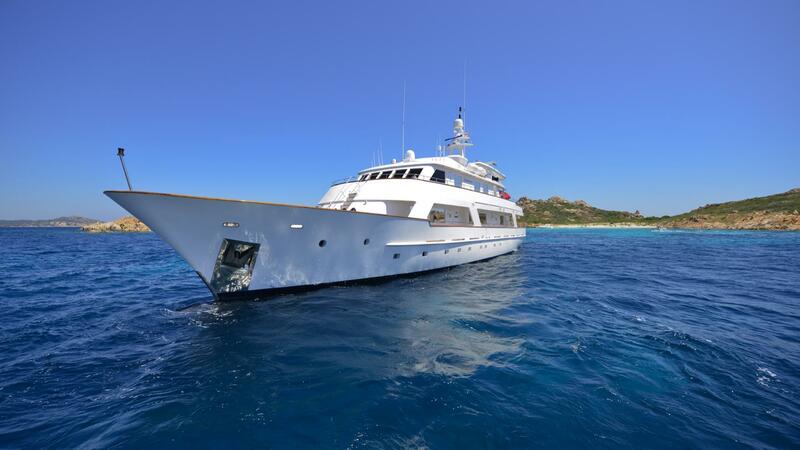 Motor yacht NUMBER NINE (ex COMMITMENT) was built in Italy to Dutch design. 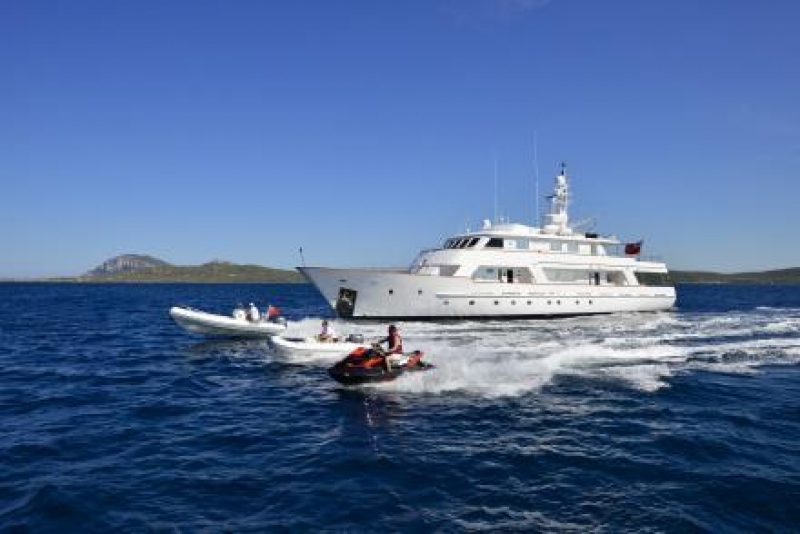 Her design has enabled both superb seakeeping qualities and an excellent use of space, both inside and out, giving NUMBER NINE a perfect combination of private cruising. 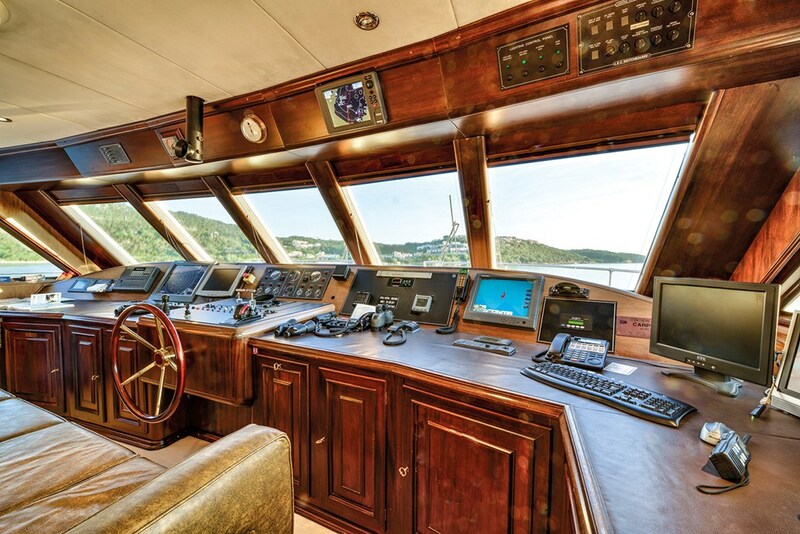 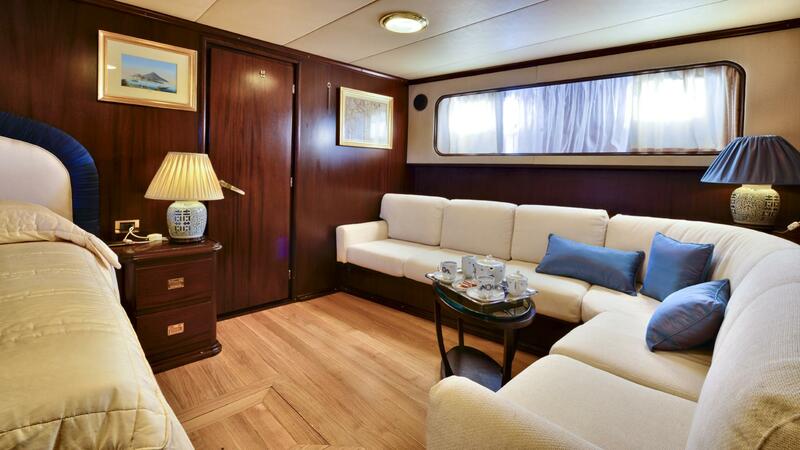 After completing a refit in 2003, 2007, 2013 and in 2019 the interior has a feeling of special warmth combined with great appeal. 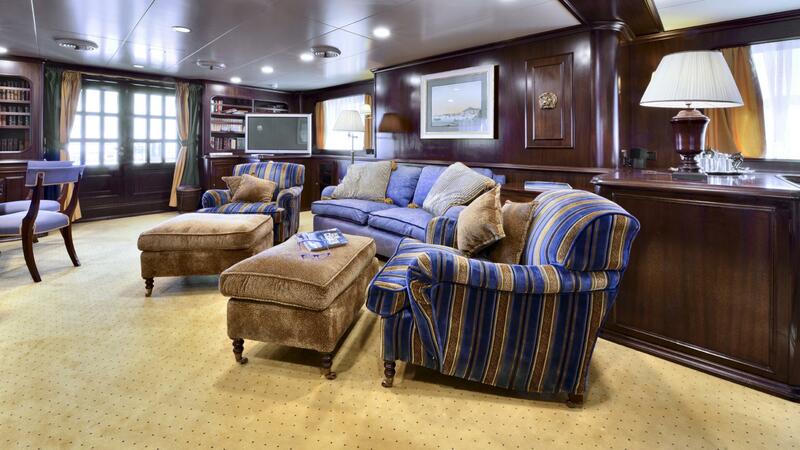 The interior spaces feature rich mahogany panelling surrounding. 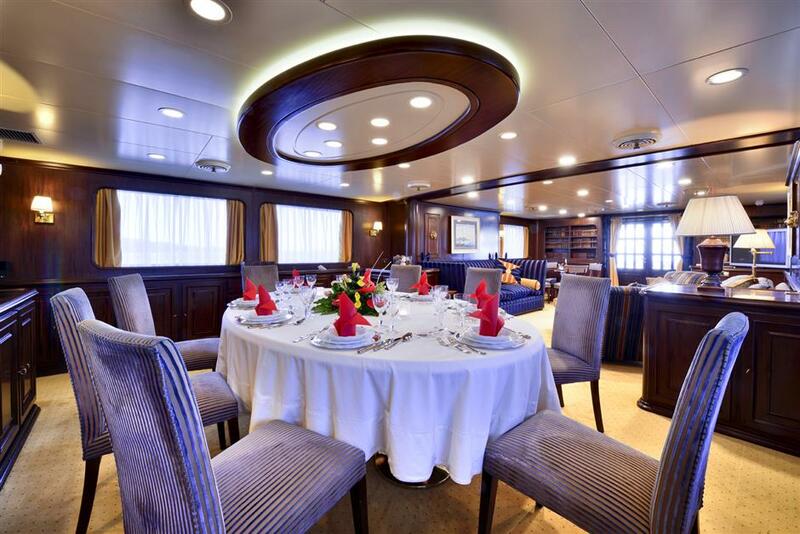 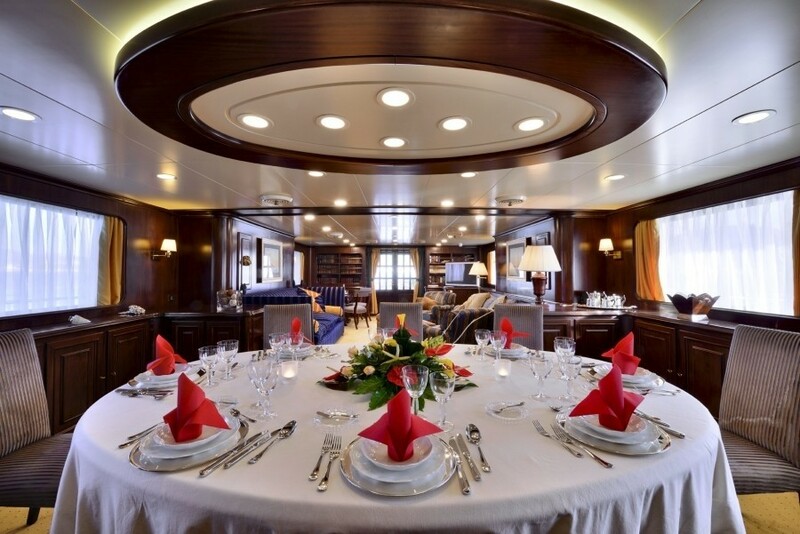 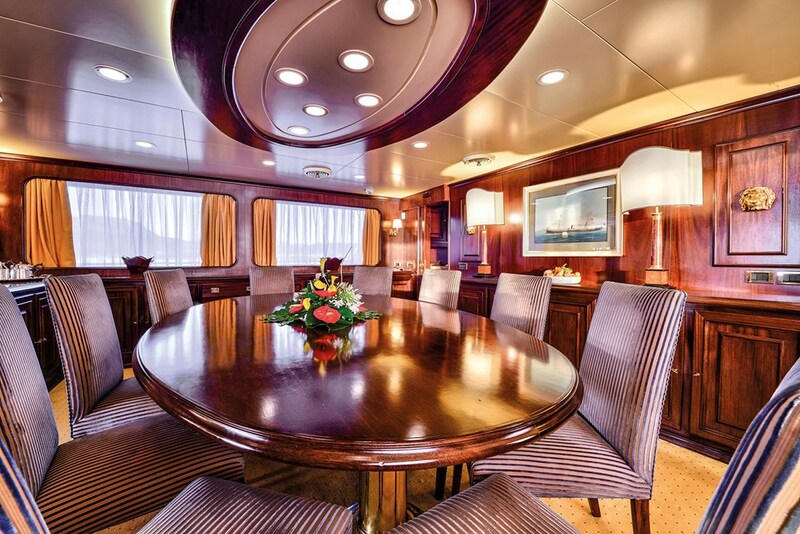 The Main saloon with dining for twelve and games area, the forward Breakfast area, and the Aft deck and boat deck which both also have dining facilities for twelve. 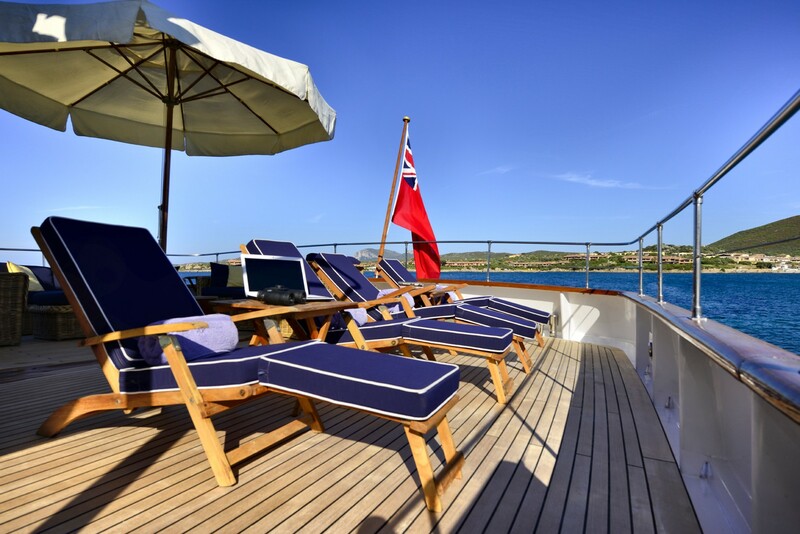 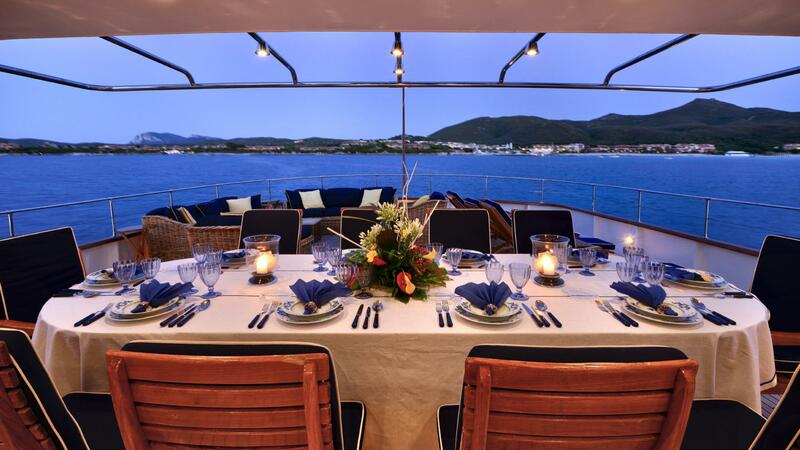 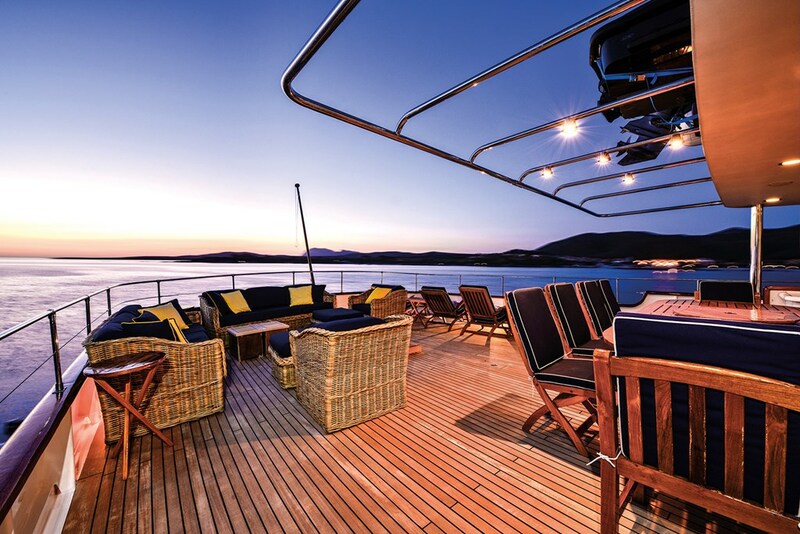 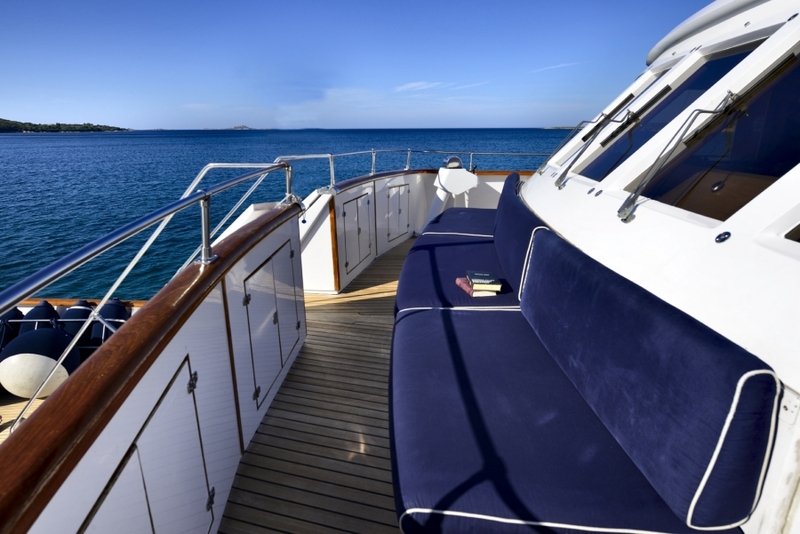 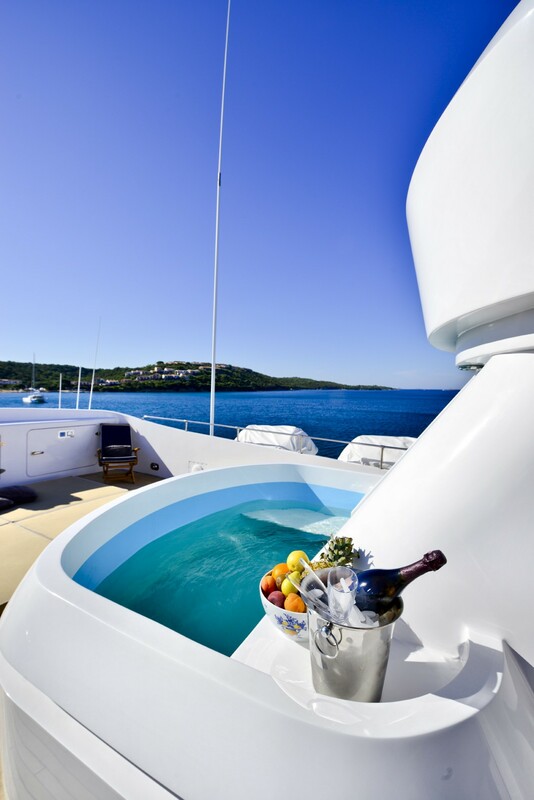 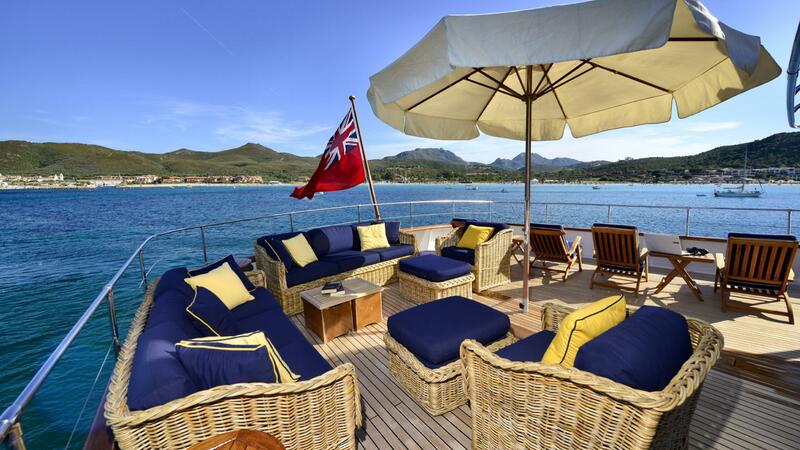 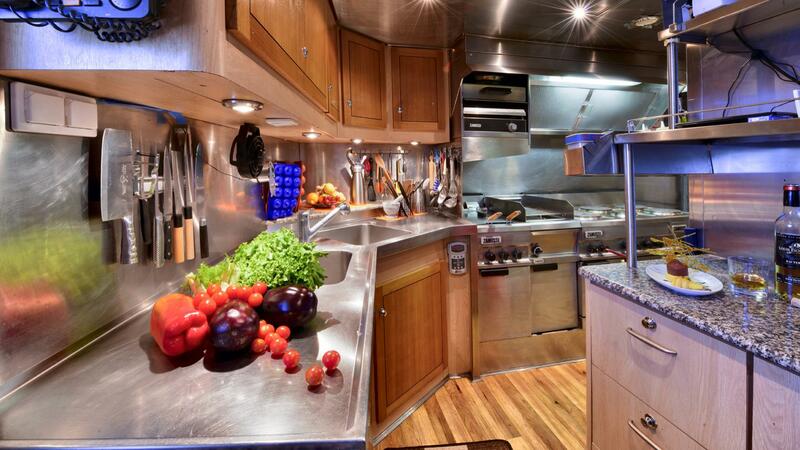 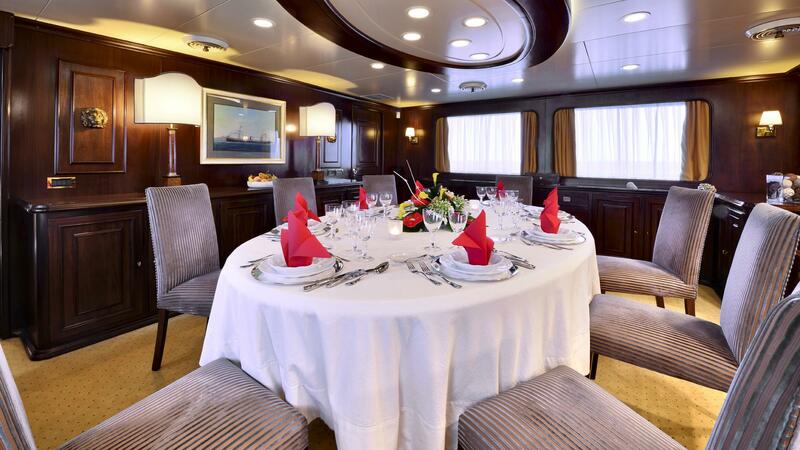 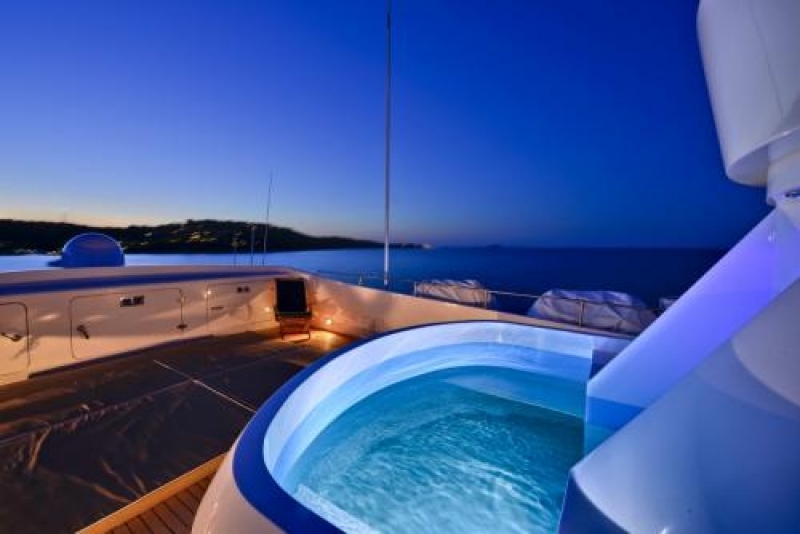 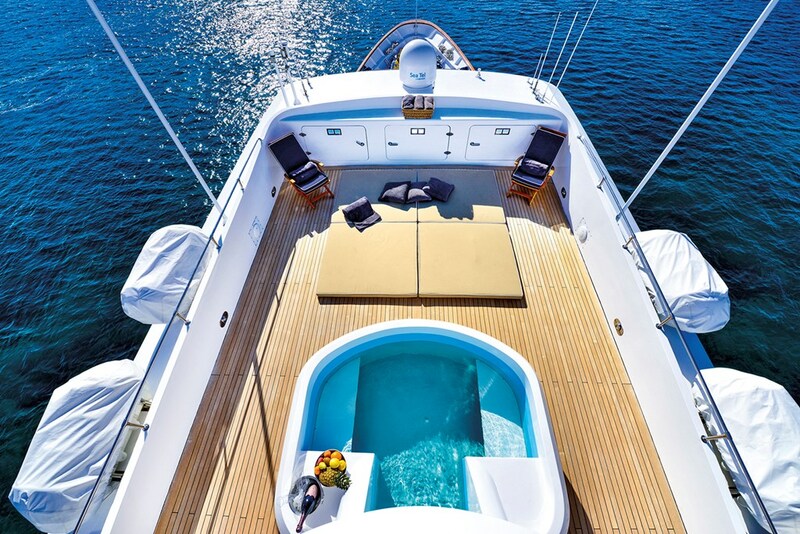 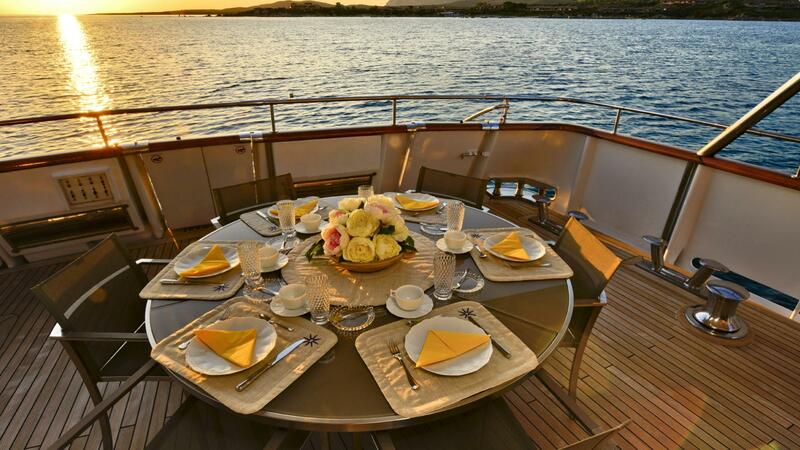 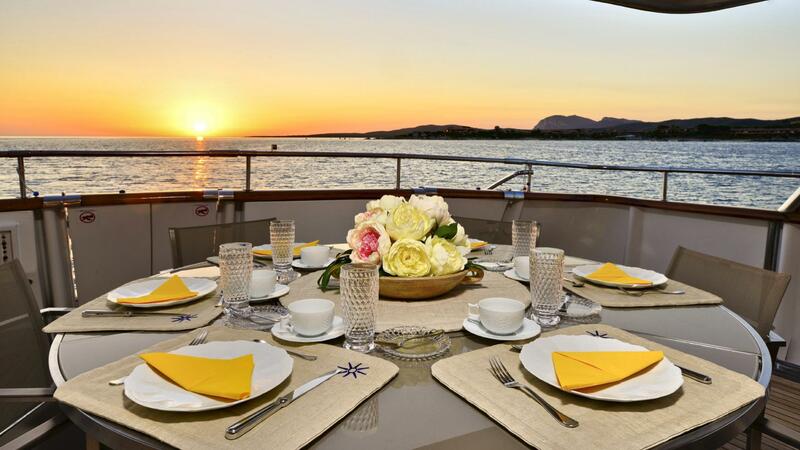 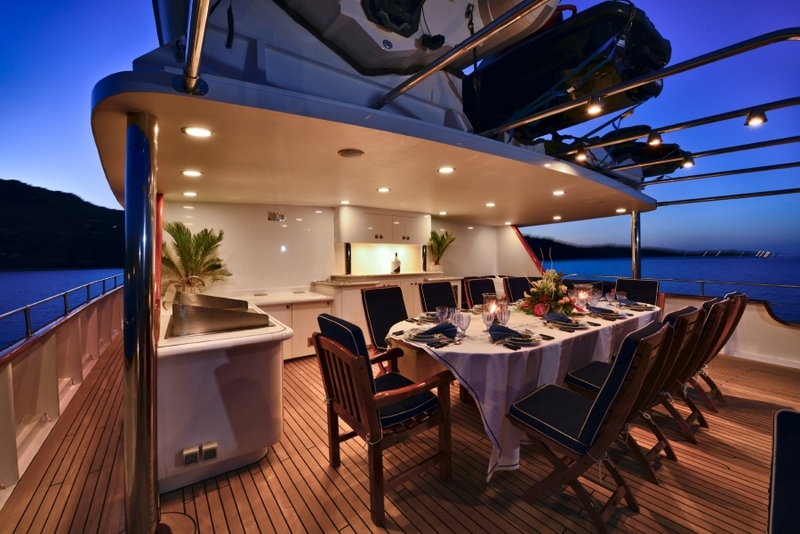 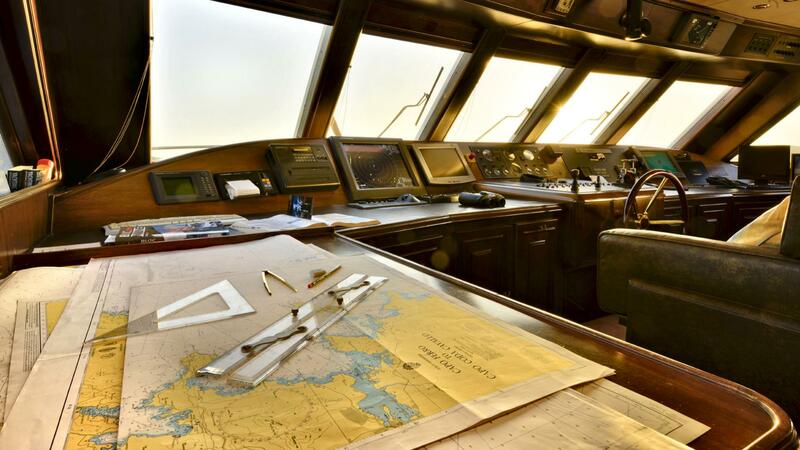 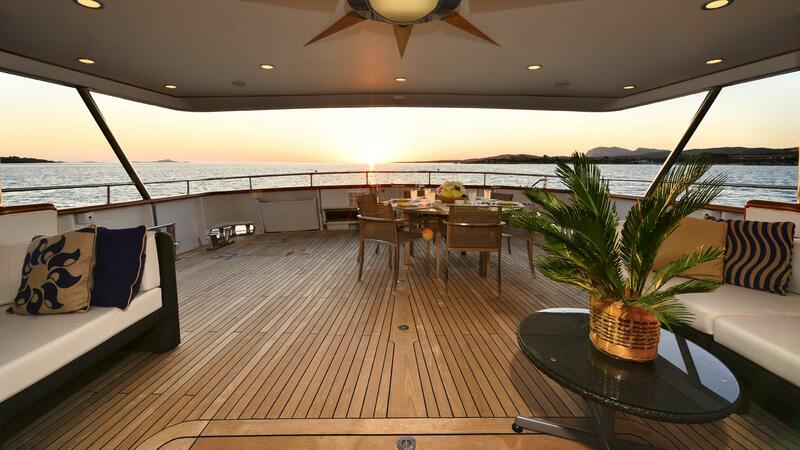 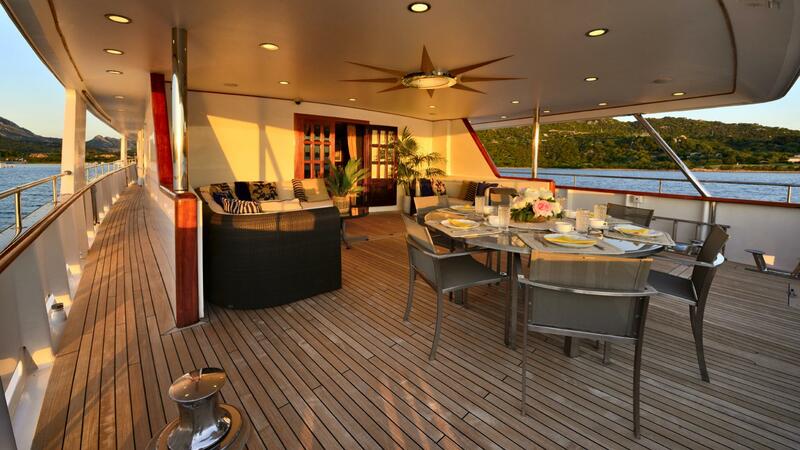 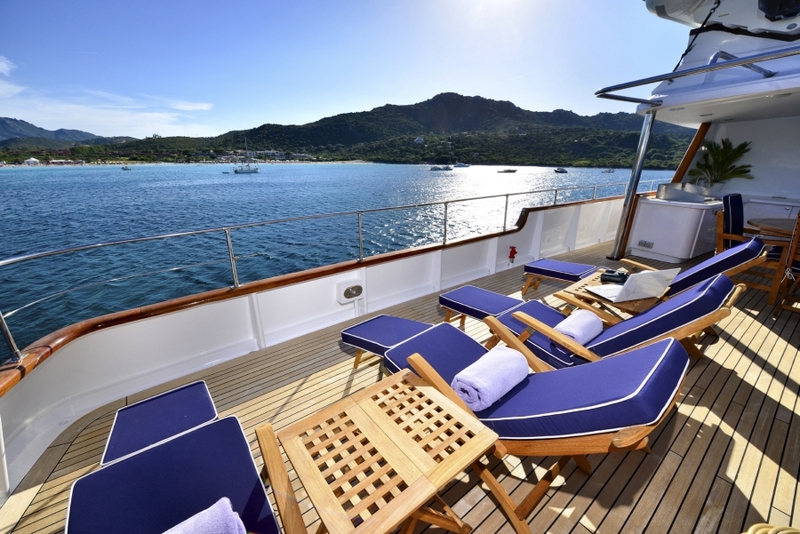 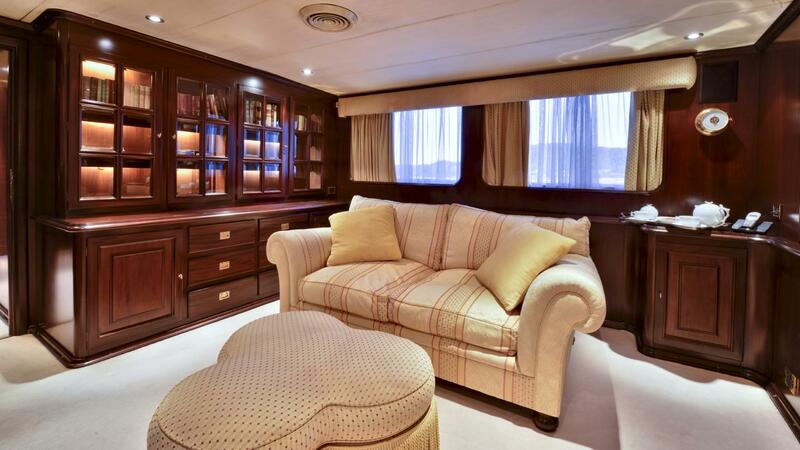 The choice of four dining areas and a private sun deck just add to the list of excellent facilities on board. 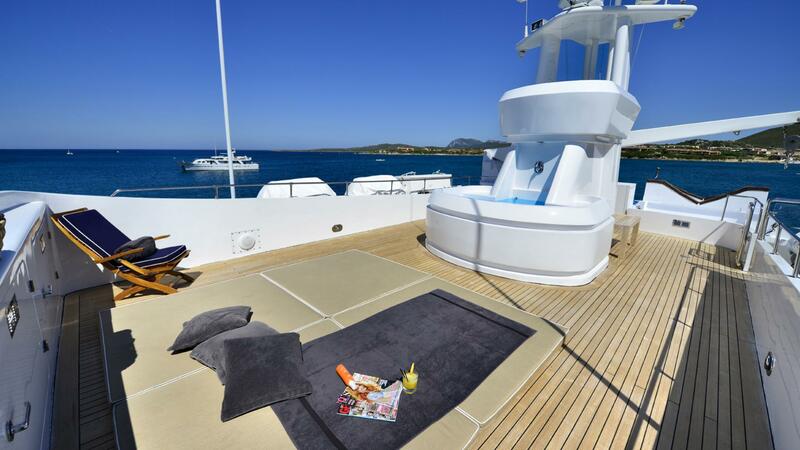 Several seating areas and sunbathing area are available on deck. 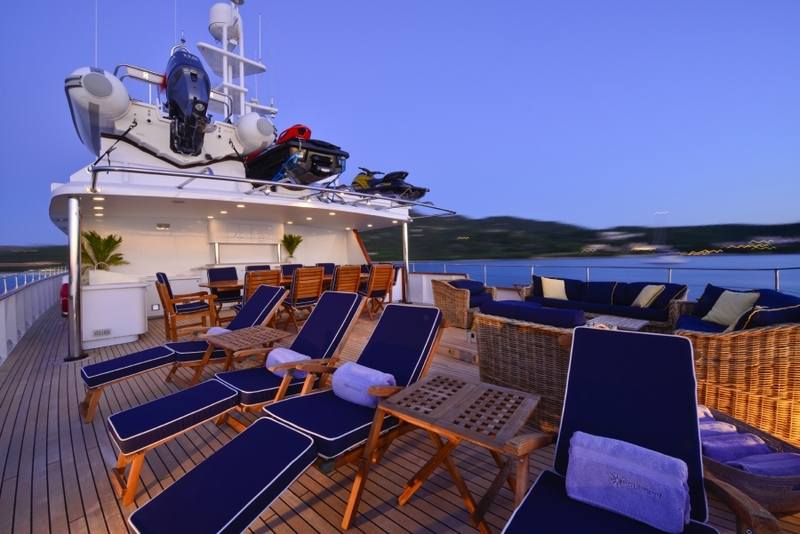 There is a plunge pool on the upper deck, reserved for sun worshippers with total commitment. 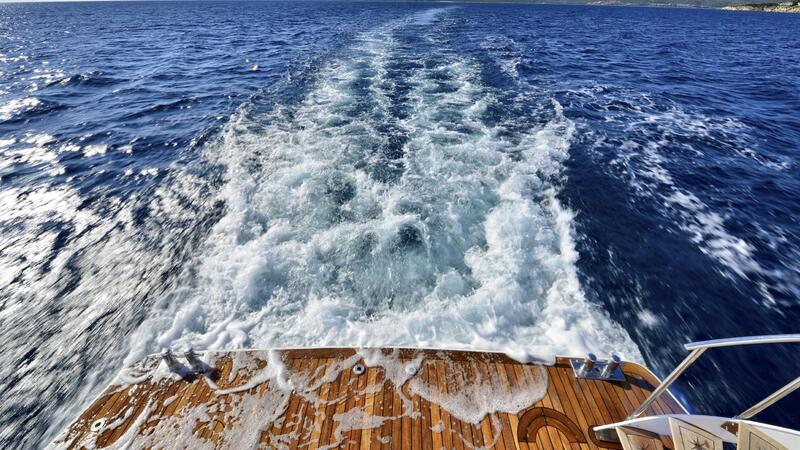 This displacement yacht feature zero-speed stabilizers for a total comfort. 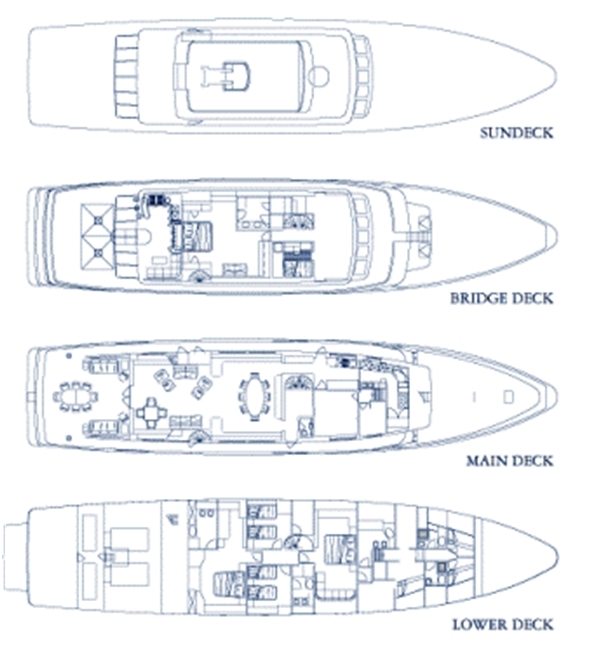 She can reach a top speed of 13 knots and cruises comfortably at 12 knots with a range of 3,000nm. 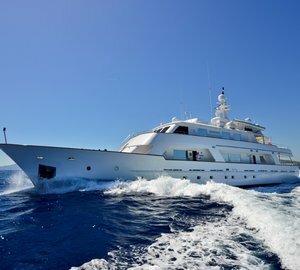 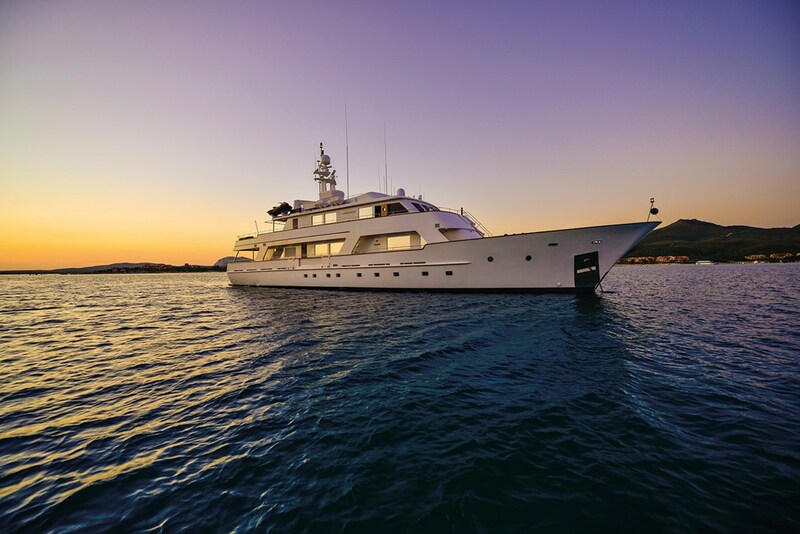 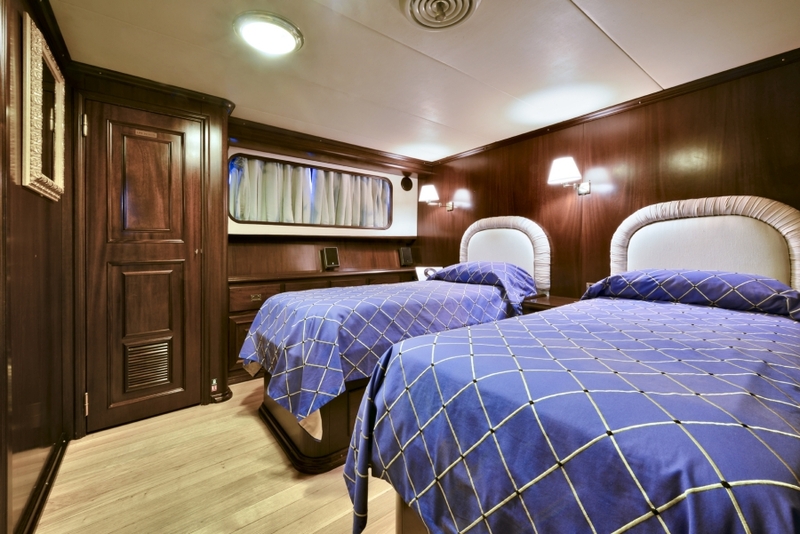 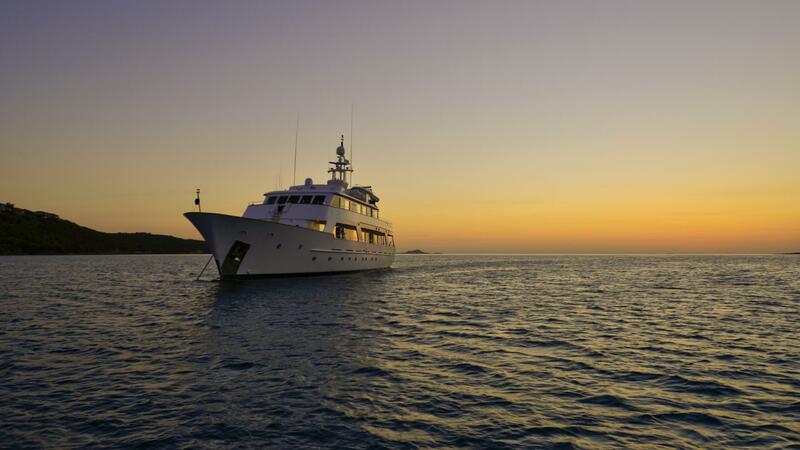 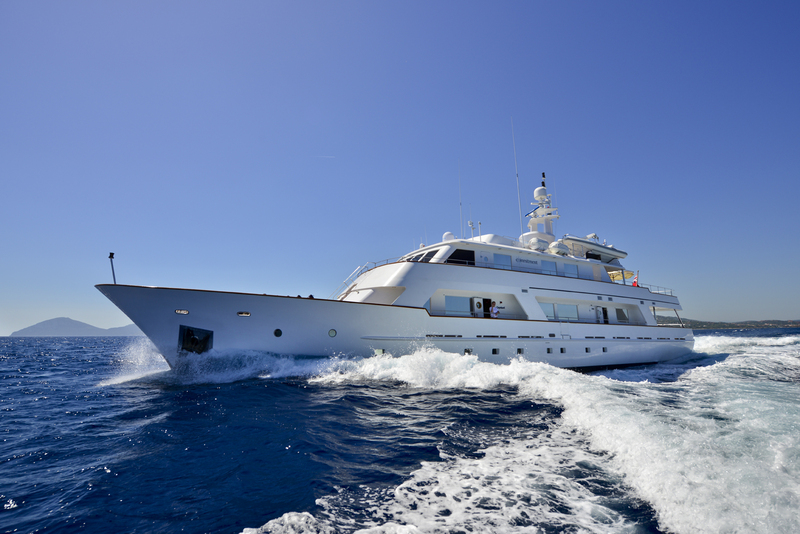 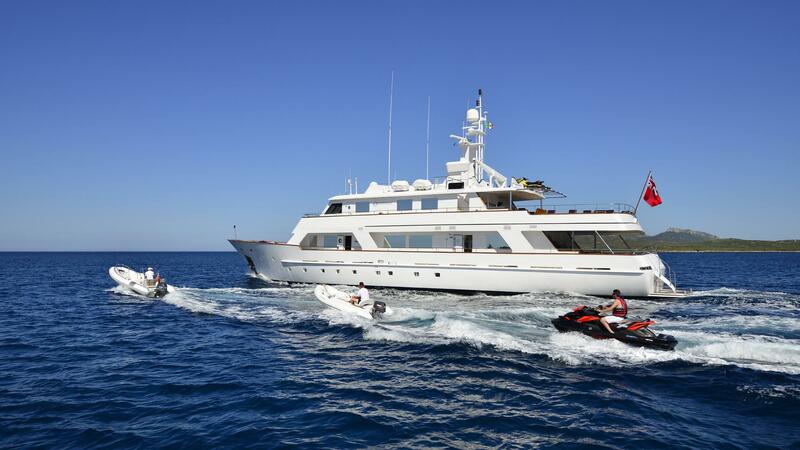 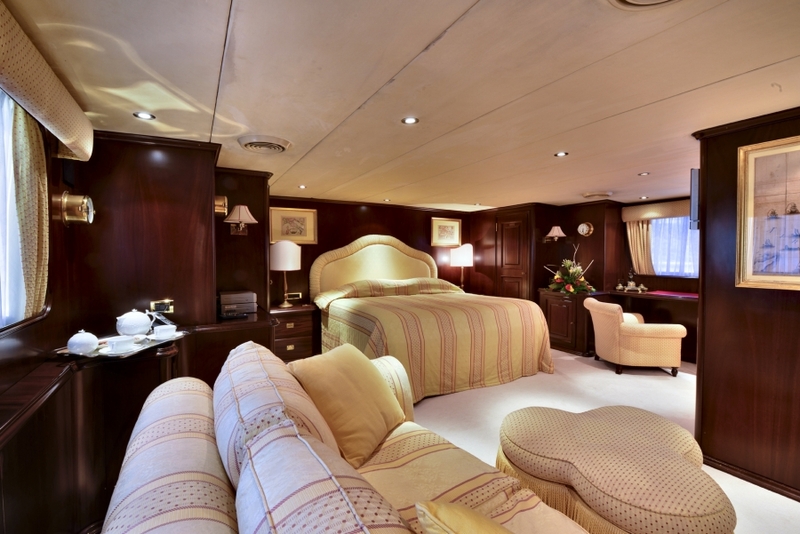 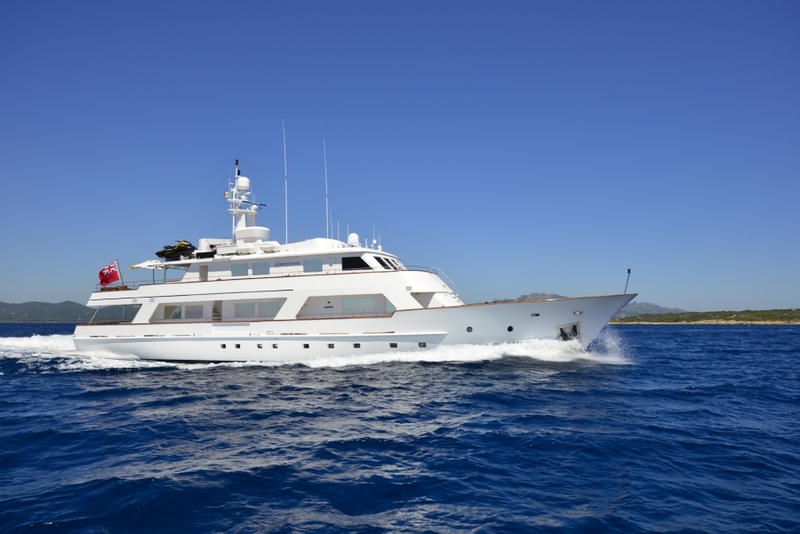 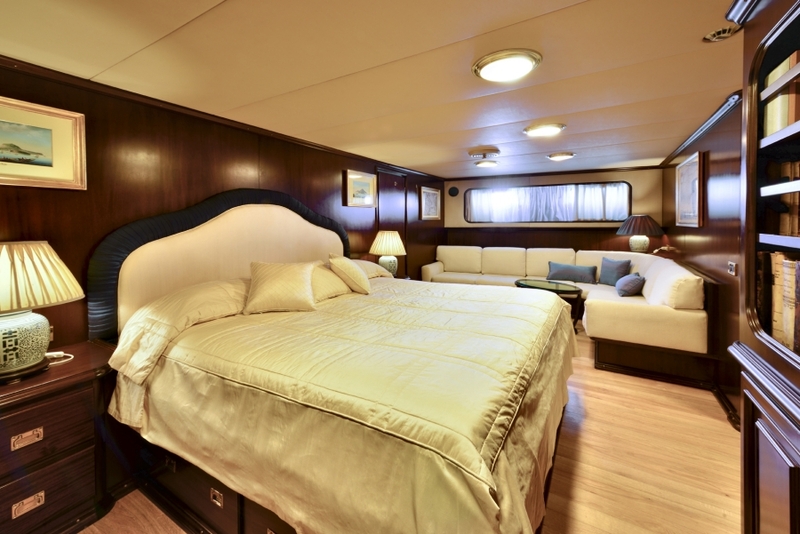 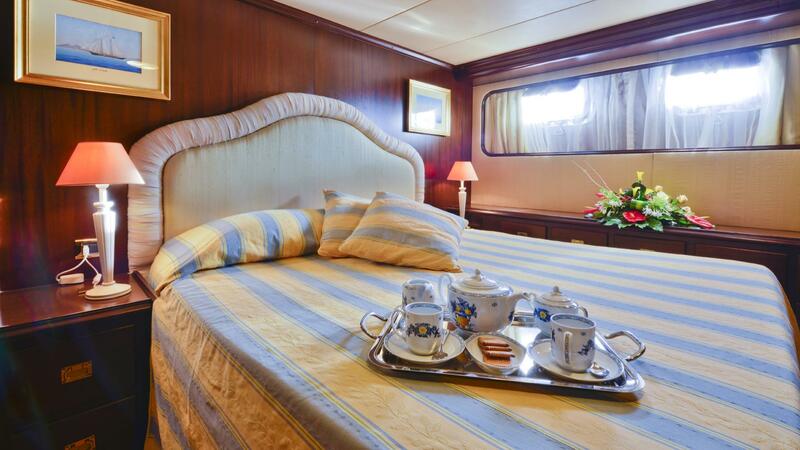 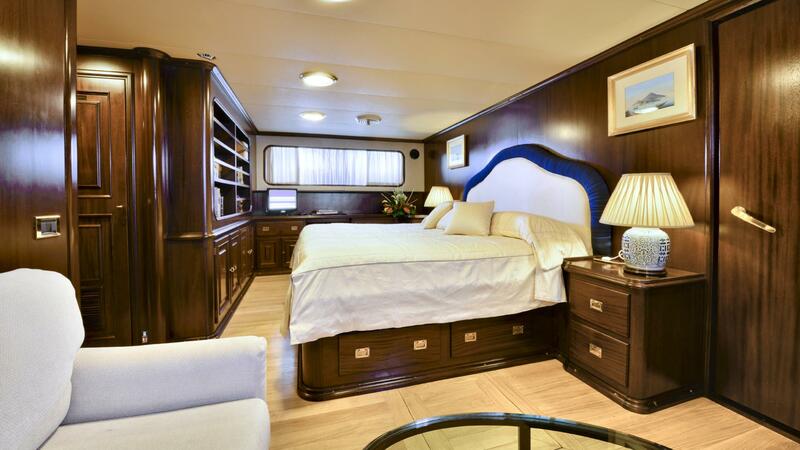 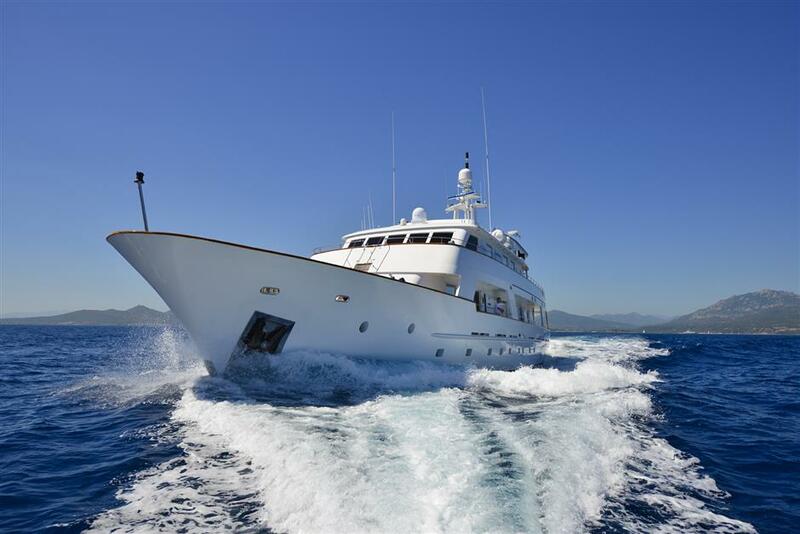 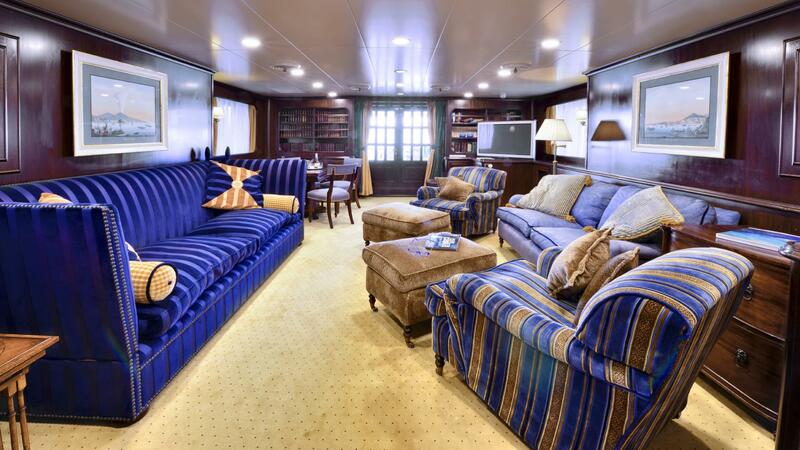 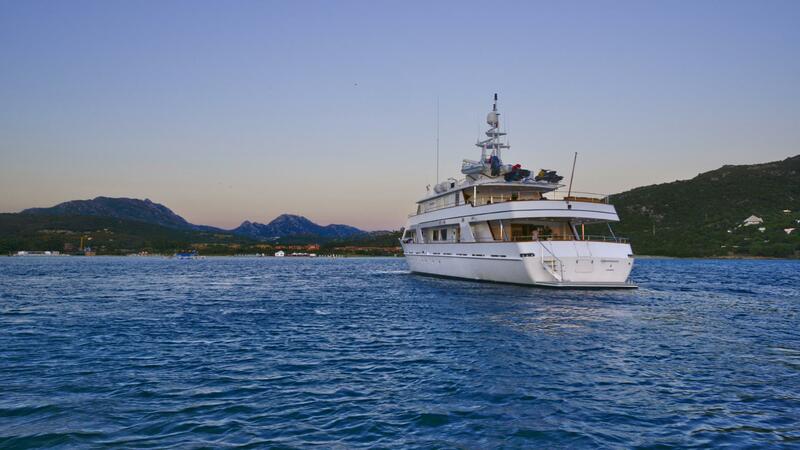 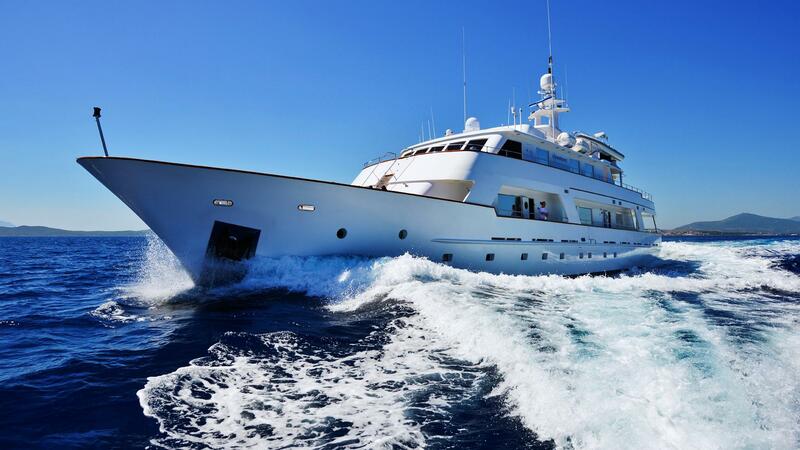 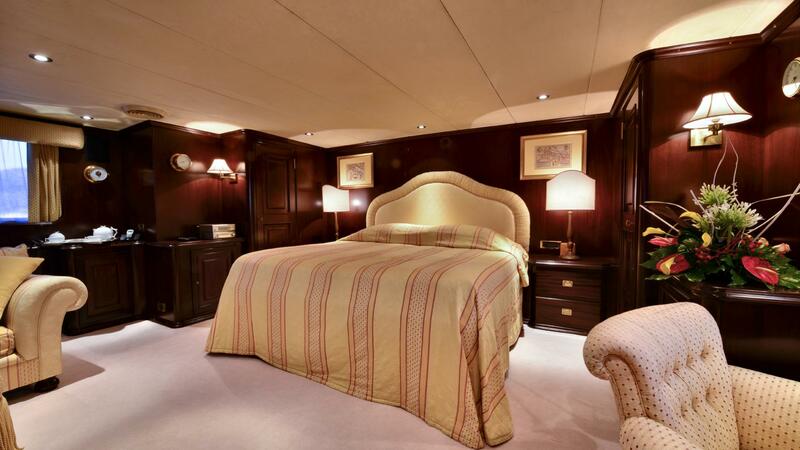 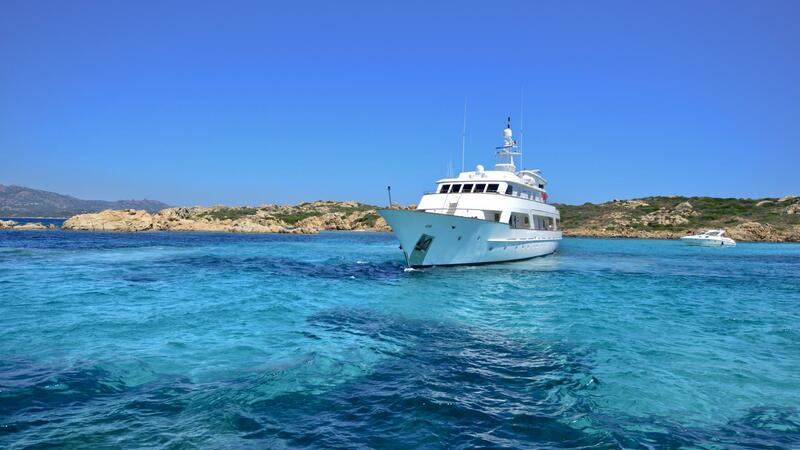 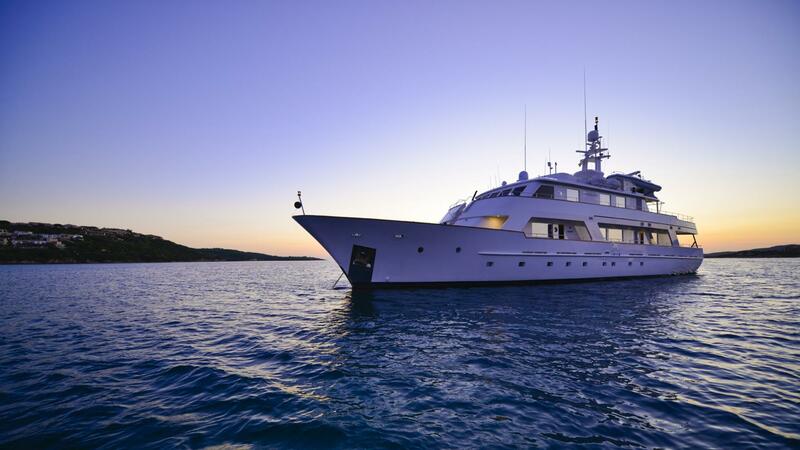 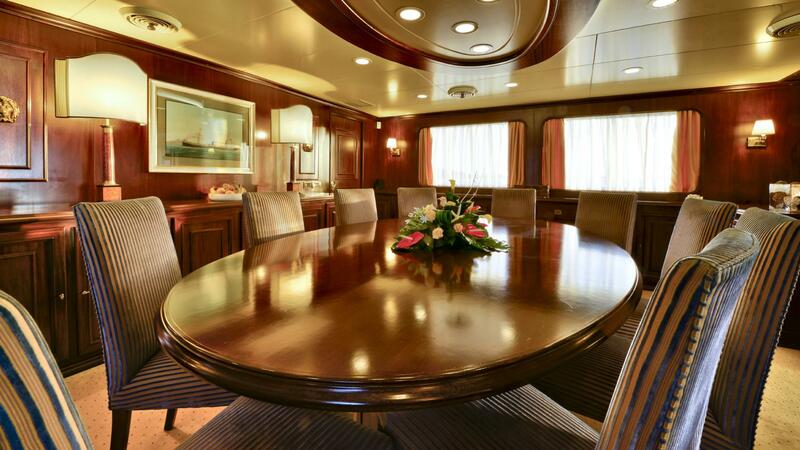 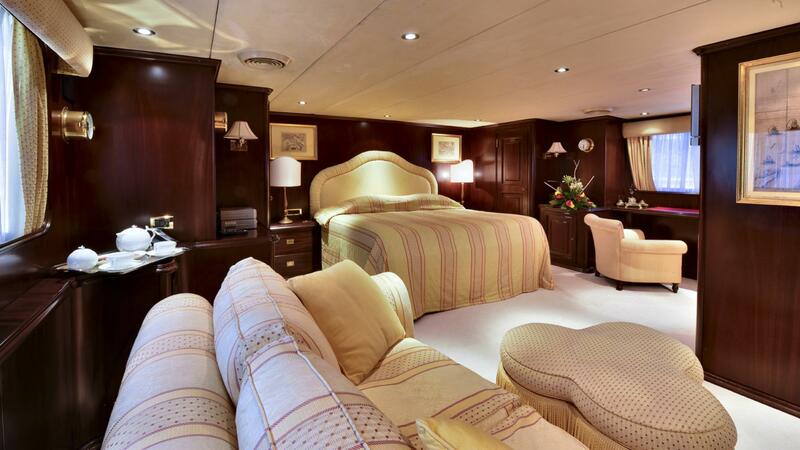 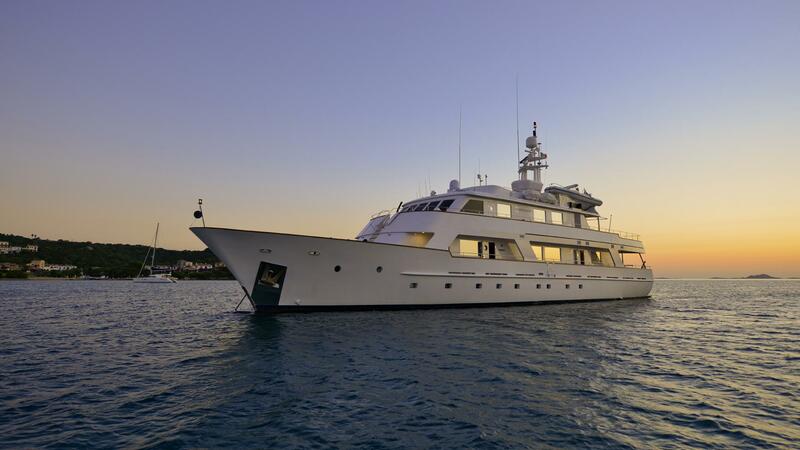 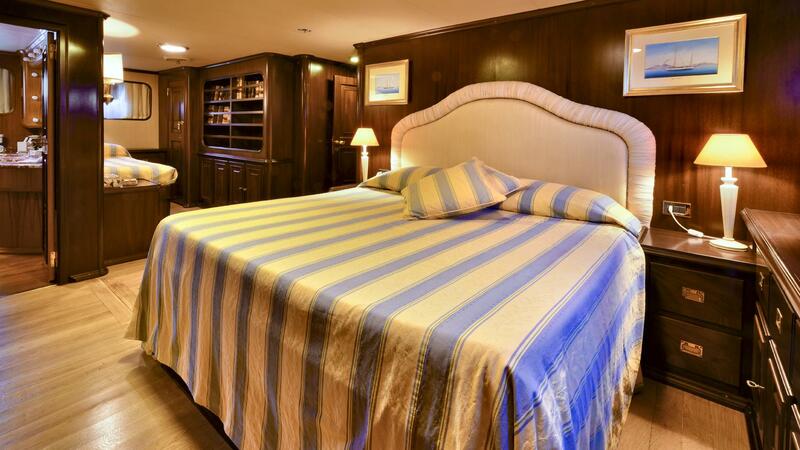 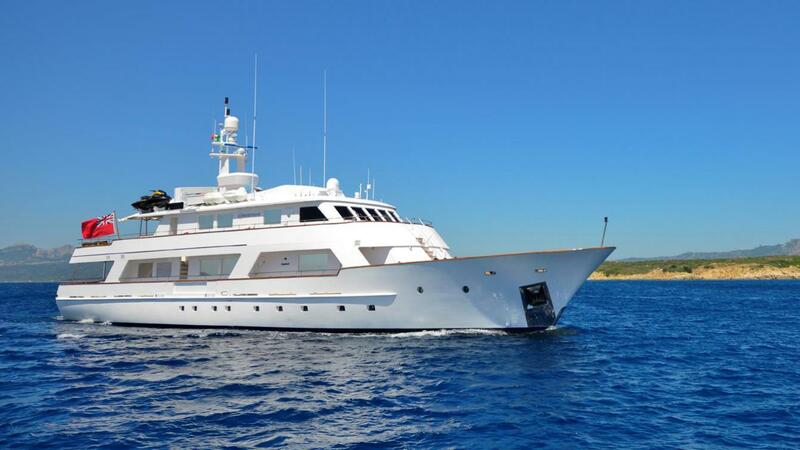 NUMBER NINE can accommodate up to 11 guests comfortably in 5 staterooms. 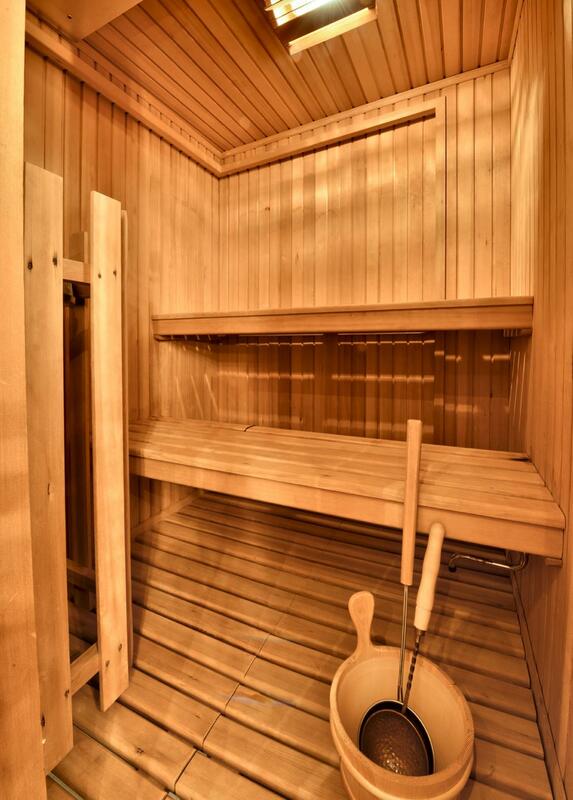 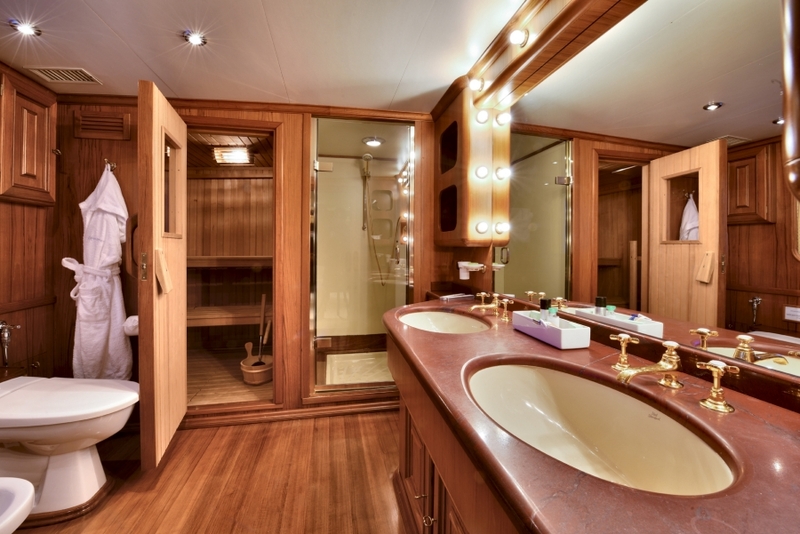 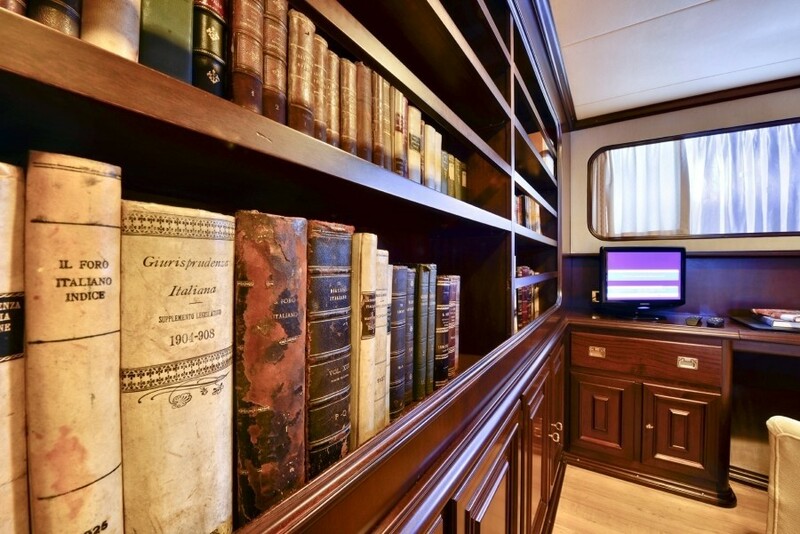 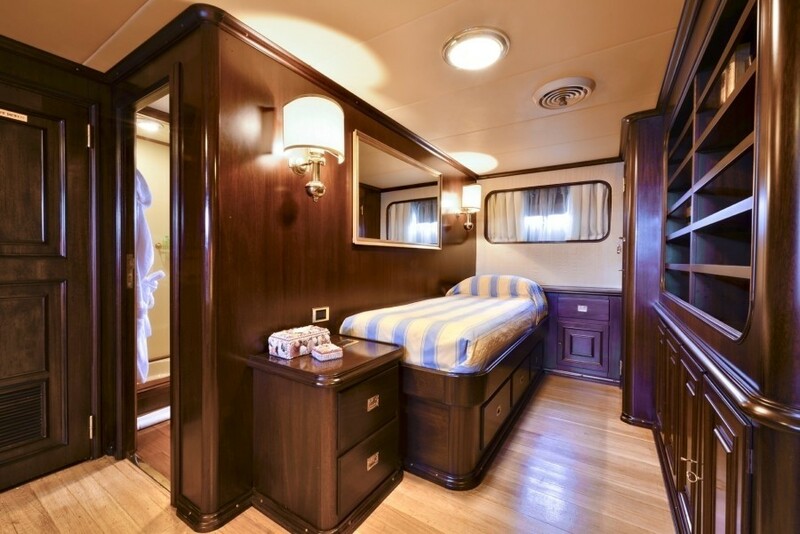 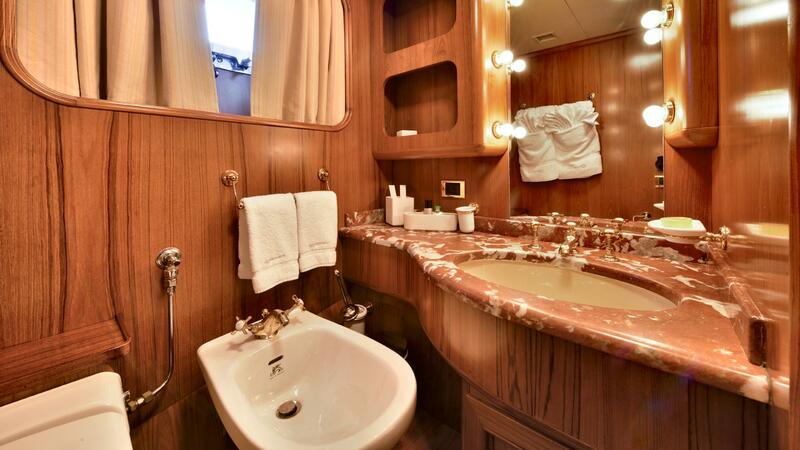 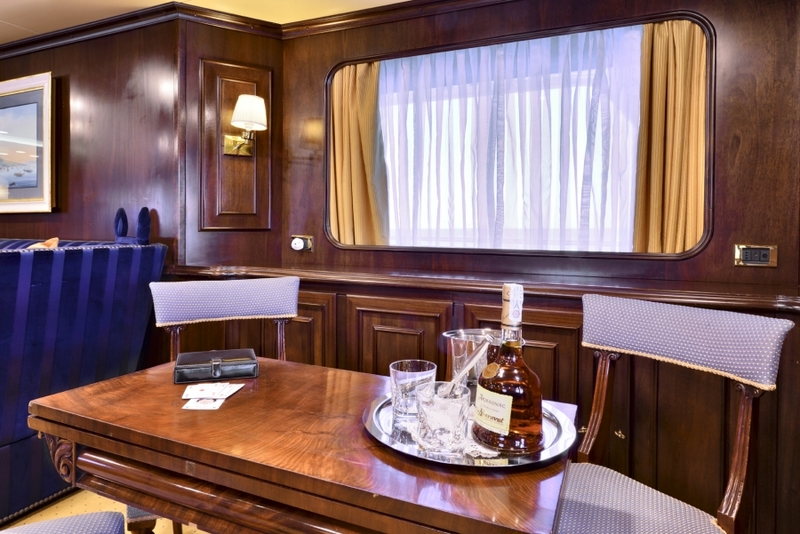 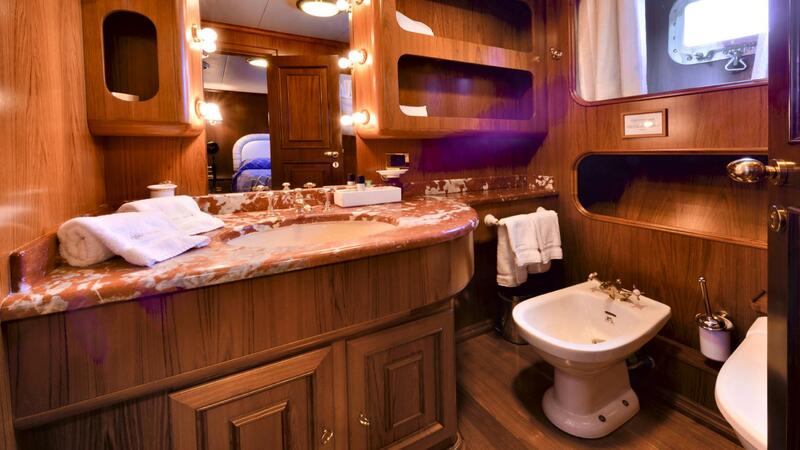 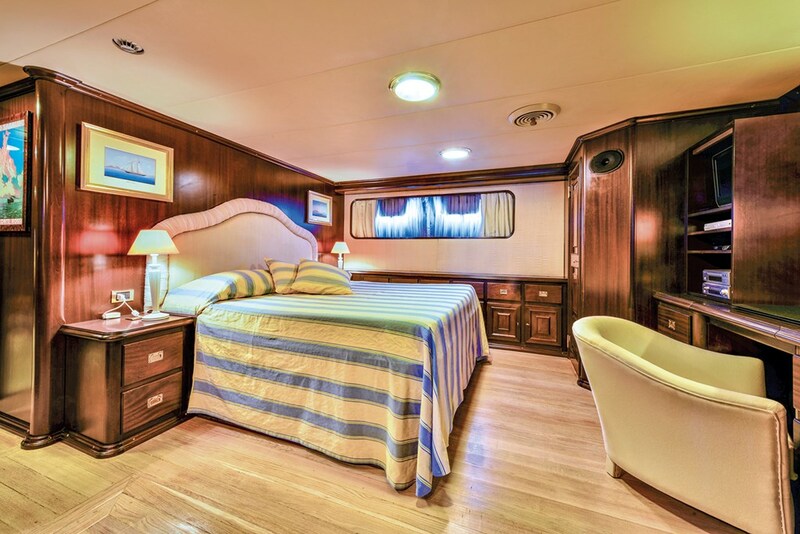 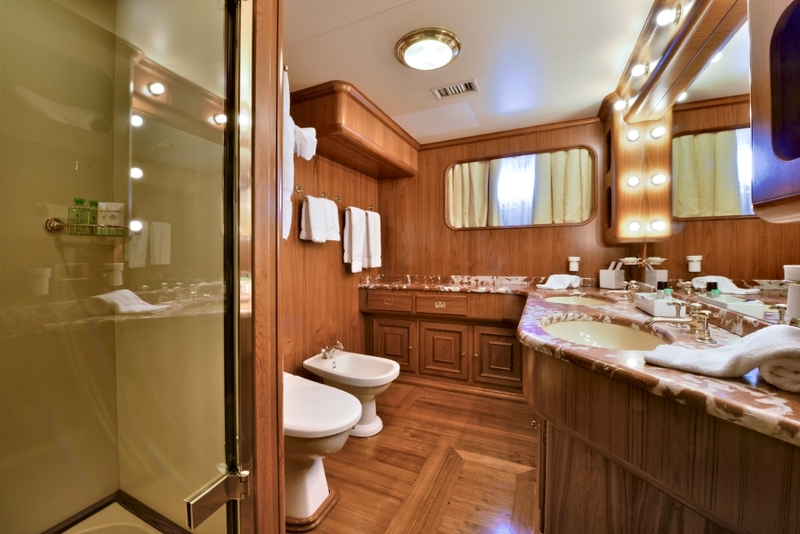 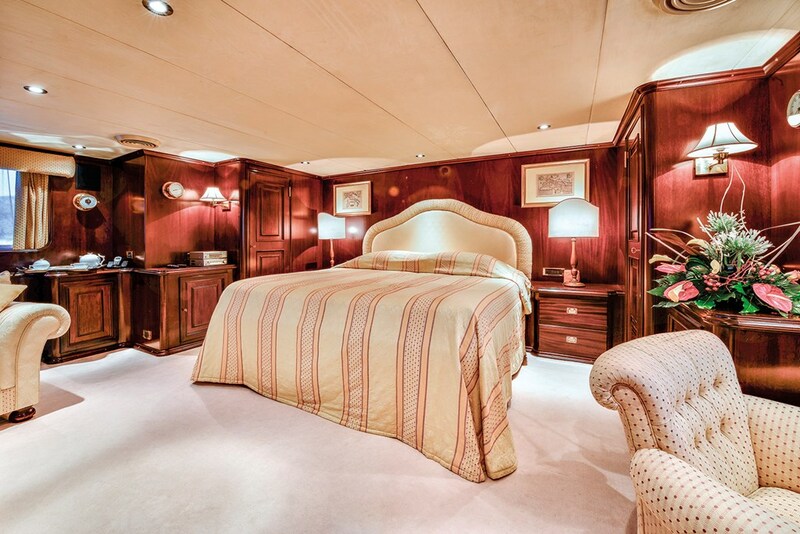 There is a Full-width master stateroom on the upper deck with en-suite shower room, sauna, and lounge. 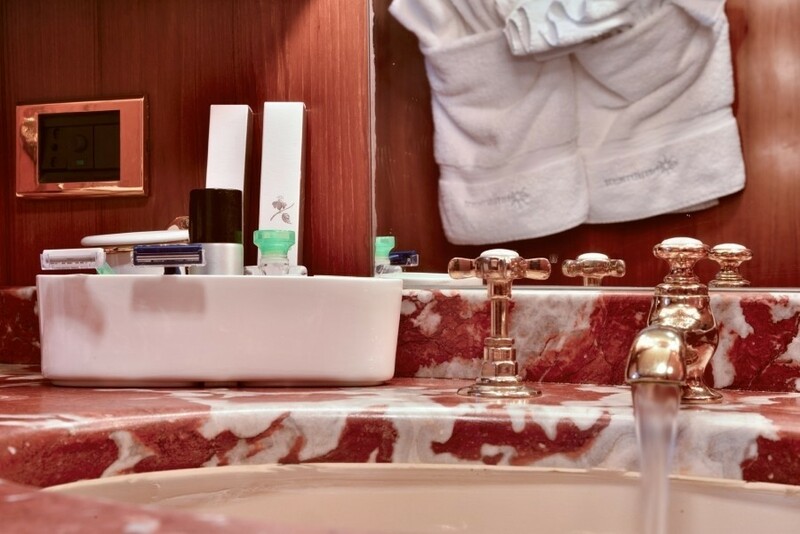 There are also two full-beam cabins on the lower deck with king-sized beds, one with en-suite bathroom and spa pool, the other with en-suite shower room. 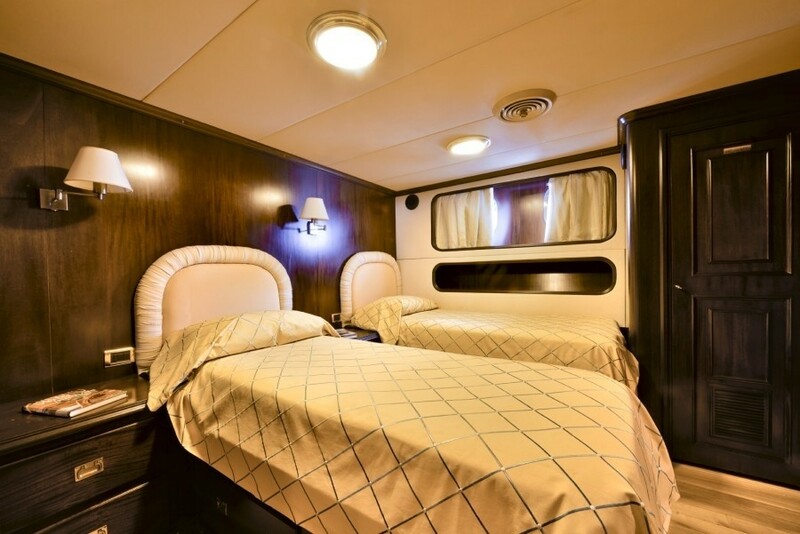 There is an option to have an extra single permanent bed by arrangement in this room. 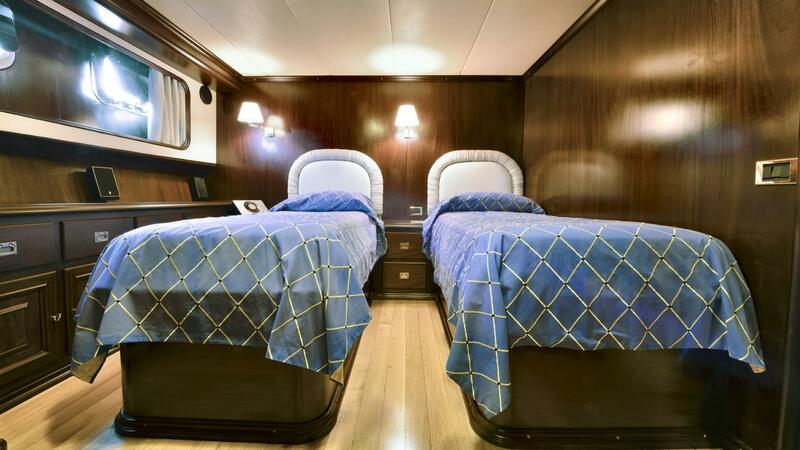 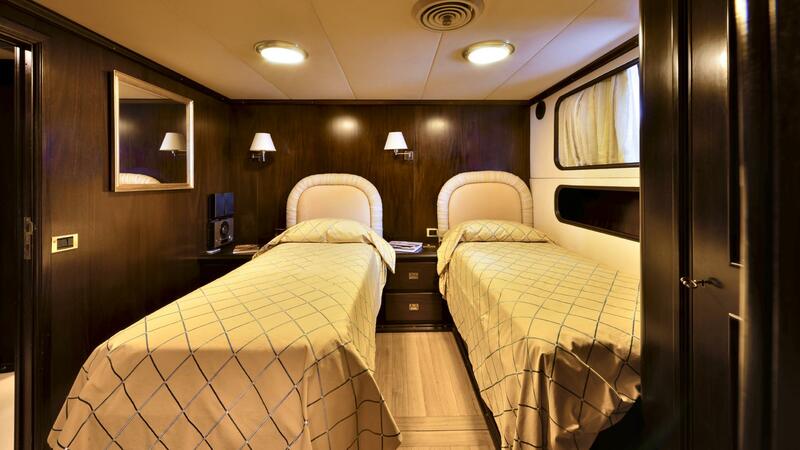 Finally, there are two twin-bedded cabins with en-suite shower rooms. 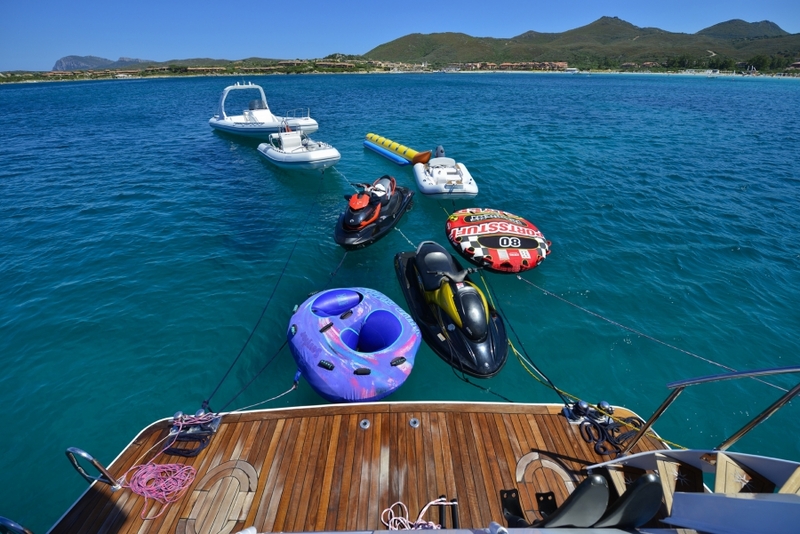 Please inquire for a full list of water toys & amenities.